In 1849 Theodor Cantor published an article about a fighting fish that he called Macropodus pugnax [1, 2]. In 1909 C. Tate Regan realized that Cantor made a mistake and that pugnax already was an excisting related species. Regan renamed Cantor’s fighting fish to the now common familiar name Betta splendens. All the now so common known breeding forms of Betta splendens were derived from the short-finned (plakat) wildtype . For ages the short-finned form was held by the people in Thailand. The Thai bred fighters from wild caught bettas. Their main objectives were to develop its fighting nature, hardiness, size, fighting style and color. Selection of breeders was made by organizing fights with bettas from other breeders. The winner became the model for the next generation of fighters. Because natural selection was not present here, after many generations bettas arose with a slightly longer dorsal and caudal fins. These fish didn’t have the desired “fighting spirit” because they were less aggressive and couldn’t manoeuvre as fast than their short-finned cousins. This betta with longer fins was now only bred for their beauty. Probably this form was already established when the Europeans and Americans came to South-East Asia in great numbers (1850). Around 1960 breeders from India succeeded to breed a bettas with two tailfins, the so-called doubletails . A typical characteristic of these fish is the extreme broad dorsal fin and the slightly shorter body length. Probably they wanted to loose this last characteristic by crossing doubletails with normal single tail bettas. The breeders noticed the offspring of these spawns had an improved form of the dorsal and caudal finnage. Slowly the aquariumhobby became more beloved in Europe and America. Asia responded to this by large-scale breeding of the longer-finned Betta splendens in big breeding-farms. Now hobbyists in Europe and America started to select these fishes in order to obtain certain characteritics in their fish. In 1960 an American breeder, Warren Young, succeeded to breed a betta with extreme long fins [1,4]. Young called these bettas “Libby-bettas” after his wife Libby. These fish were sold to hobbyists all across the world and to the farms in Asia. It was this development that led to the now so familiar veiltail tailtype. Around the same time a German breeder Dr. Eduard Schmidt-Focke bred the first deltatail betta, a betta with a symmetrical triangular tail shape. In 1967 in America the IBC (International Betta Congres) was founded. 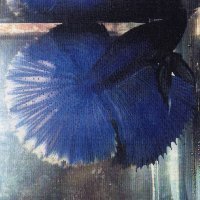 The IBC had the goal to breed Betta splendens with broad symmetrical fins instead of long. This resulted in fish with a better swim capacity. But still it took a long time before the other now so familiar tailtypes were developed. 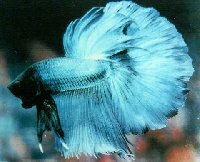 In 1980 some wellknown American betta breeders, like Peter Goettner and Paris Jones, developed the superdelta tailtype which were bettas with enormous fins. In 1984, the Frenchman Guy Delaval imported offspring of these fishes to France. Delaval selected and bred these to obtain a bigger angle of the caudal. In 1987 he succeeded to breed fishes with a 180 degrees angle. Rajiv Massilamoni realized that Deleval did what was thought to be impossible. Untill that time most Betta splendens were asymmetrical deltas or superdeltas with a maximal spread of 160 degrees. Laurent Chenot and Rajiv Massilamoni started to cooperate in order to maintain and further develop this tailtype. They tried to breed these fishes but they were to much inbred. The male didn’t make a nest anymore and didn’t know how to wrap himself around the female. After many attempts they with petstore Betta splendens and different lines, Chenot and Massilamoni eventually succeeded to breed a fish which had a mother from Delaval and the father was a melano doubletail male from a American line. This fish was called R39, and was coupled to all the females in the lines of Chenot and Massilamoni. Again some fish showed up with the 180 degree spread. The American betta breeder, Jeff Wilson called them “halfmoons”. He started cooperating with Chenot and Massilamoni and the inbreeding of the American line led more frequent halfmoon appearance in the offspring. In 1993, Chenot, Massilamoni and Wilson showed on of their halfmoon fishes at the IBC show in Tampa Florida under the name CHENMASWIL and won the “Best of show”. This was the start of a true halfmoon fever. The last decade another type of tail was developed. An Indonesian breeder, Ahmad Yusuf, developed the crowntail . In this tailtype the rays extended to outside the edges of the fin. This is why the fins get a “comb-like” appearance. But the development of different tailtypes doesn't stop here. Betta-enthusiasts from all across the world are always trying to improve the existing tailtypes but also to combine and/or develop (new) tailtypes. In the halfmoon breeding this already led to the development of halfmoon fish with degrees of ray-splitting (4-, 8- and 16-ray halfmoons). Another recent developments in halfmoon breeding are the overhalfmoons which have a >180 degree spread and the rosetails which are characterized by their extensive raysplitting. But also other combinations like halfmoon plakat, halfmoon crowntail (halfsun) and crowntail plakat are more frequently seen in the betta-scene.